Recently we hopped onto a ferry and drove for three hours on a low-key, beautifully scenic route (once out of any major cities or towns) past stately Cathedral Grove – location of towering old growth trees – to Tofino on Vancouver Island’s Pacific coast. I’d booked us three nights at a local hotel so that we could enjoy a small break from our busy schedules and listen to the uninterrupted sound of the ocean, the wind and the rain. We went with books (no bikes this time) our cameras and with the intention of long walks on the beaches and in the forest. Tofino is renowned for its rainfall but as it turned out we caught it at a time of lovely balmy temperatures and some gorgeous sun that intermittently made an appearance. It doesn’t seem to matter whether the sky is blue or a moody shade of grey, every incarnation seems to suit the environment. The surfers didn’t seem to mind either as they made their way in and out of the frigid waters. 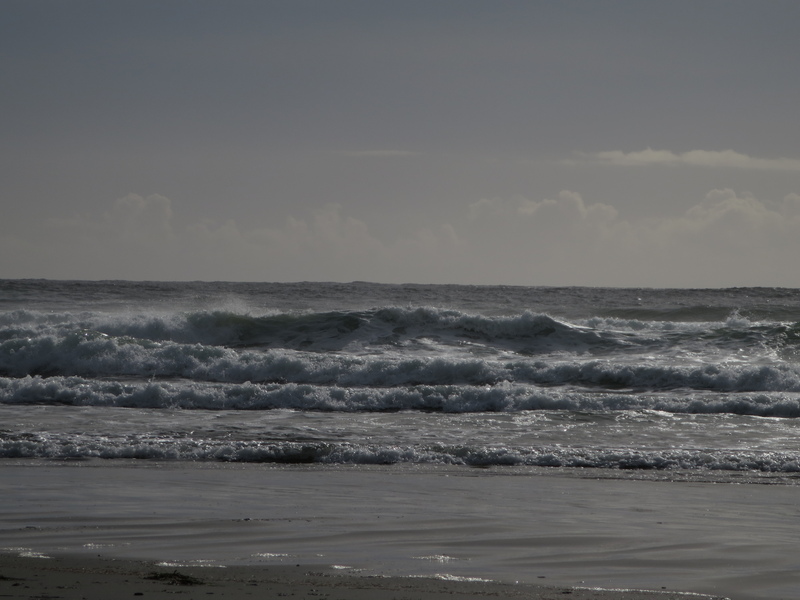 Perhaps the most popular beach with tourists and surfers alike is Long Beach, located in Pacific Rim National Park itself (the town of Tofino is outside the border of the park). The always cold ocean means wearing a wetsuit year round…. Every night we heard the ocean crashing on the beach below our open bedroom window. One of those nights I woke up to light edging around the curtains and quietly got out of bed to look out at the moon reflecting perfectly off the waves. Each day we walked and walked, ate, drank some wine and read. 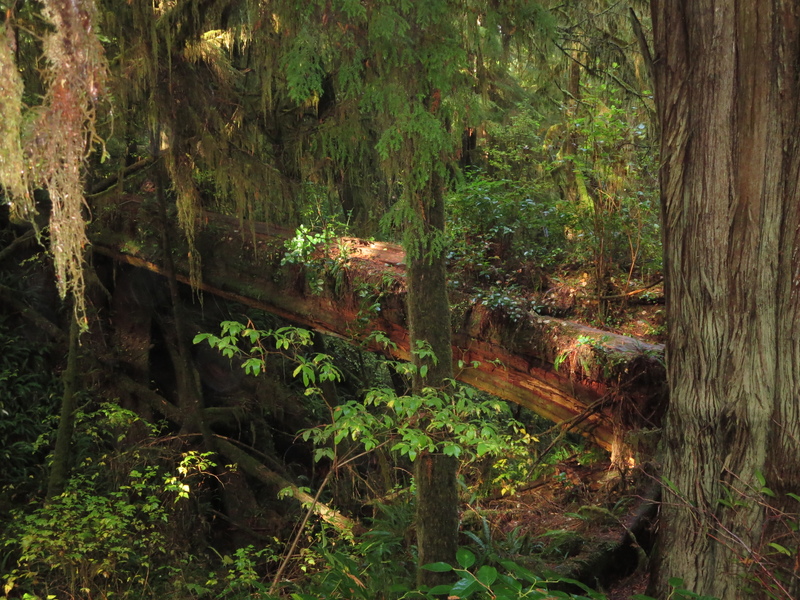 We roamed from the openness of the beaches to the confinement of the rainforest walks with their remnants of ancient old growth cedar and Douglas fir trees. The forest is full of seen and unseen life amidst the decaying mulch, yet unlike the constant roar of the ocean the forest is eerily quiet, interrupted by the occasional sound of birds, a singular rather lonely sounding frog (it’s not the mating and breeding season when they’re usually in full croak) and the dripping of water from leaves after a night of pouring rain. 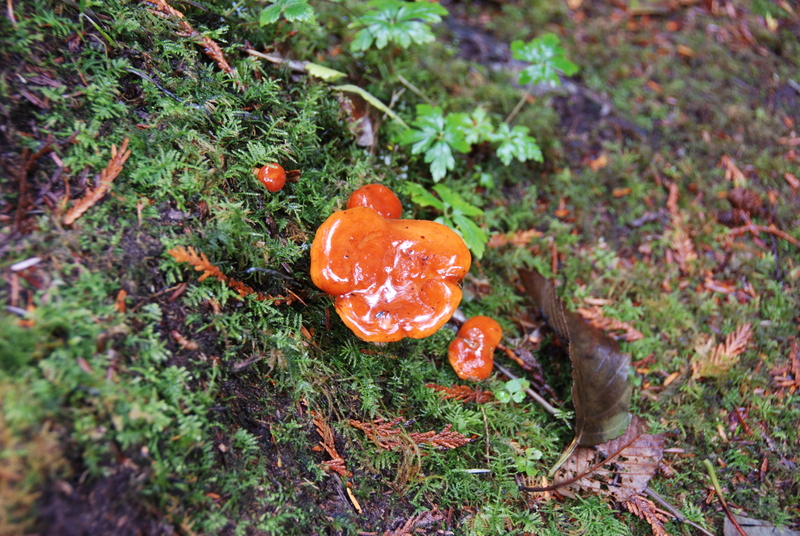 Boardwalks protect the delicate forest floor. It’s a beautiful area, and still wild in places. 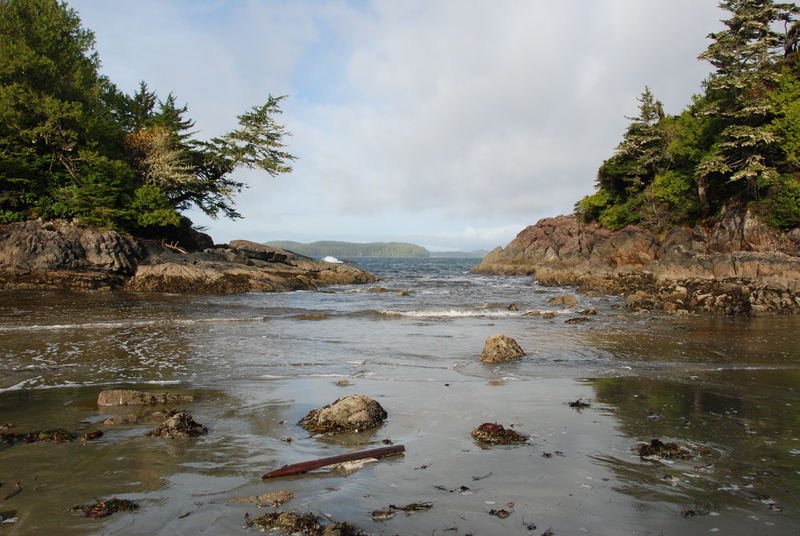 Bears, cougars, wolves, a variety of birds, orcas, fish and sea lions are some of the species that make the area home…. we saw evidence of a bear on one of the forest walks near the water. Fishy-smelling droppings (very fresh) and further on another pile, this time full of berries. We left the bear to his or her peace and moved on to a totally deserted bog walk, completely different, just a few minutes from the forest. Acidic soil and a lack of nutrients means that the only trees that grow here are Shore Pines, stunted and gnarled…. 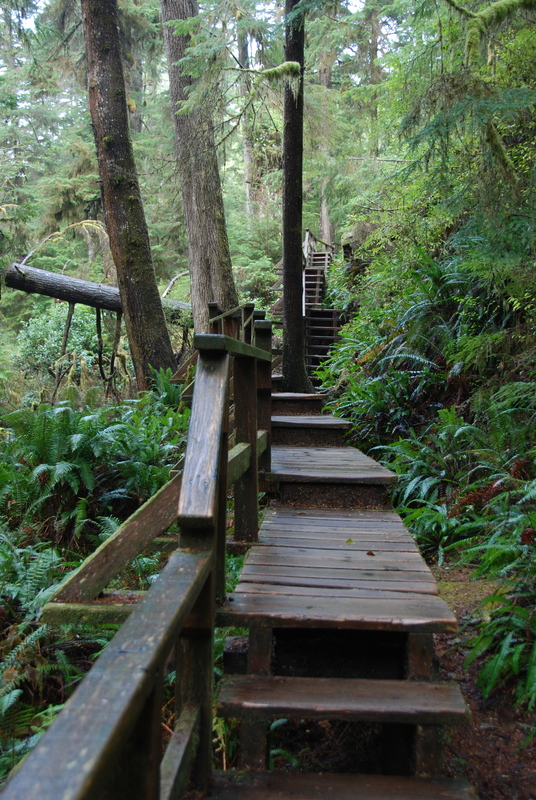 The start of the West Coast Trail begins in the region, a trail that sounds fantastically challenging and which seems to produce many injured hikers every season. It passes through First Nations territories that have been occupied for thousands of years and has a fascinating past as a life saving trail for shipwreck survivors and rescuers. For the first time I did consciously think of the dangers of tsunamis, with local sirens and notices along the highway advising when you are ‘now entering’ and ‘now leaving’ the tsunami hazard zones (i.e down hills and up again). It didn’t detract from our enjoyment, rather it enhanced the sense of how vulnerable this low-lying region is, and how truly wild the west coast could be, even when it looks so benign.